This recipe has been developed with a traditional, luxurious beef wellington in mind. The cauliflower is covered in a layer of flavourful, creamy mushroom pâté and gets a grating of cheddar before being wrapped up in a pastry coat that bakes to a golden cheese-topped crust… Need we say more? Heat the oven to 200°C/180°C fan/gas 6. Put the cauliflower on a roasting tray, drizzle with a little oil and season with salt and pepper. Roast for 30 minutes until starting to turn tender and golden. Meanwhile make the mushroom pâté. Heat a glug of oil and the butter in a large deep frying pan, then add the onion and fry over a medium heat for 5 minutes until soft. Add the garlic, mushrooms, rosemary and thyme and fry for 10 minutes more. When the mushrooms are tender, turn up the heat and add the sherry. Bubble for 5 minutes until there’s hardly any liquid remaining. Turn the heat to low, add the cream cheese and parsley, then stir well. Pour into a food processor and whizz until smooth. Taste, then season with salt and pepper and a squeeze of lemon juice. Spread out on a plate and chill until needed (see Make Ahead). Remove the roasted cauliflower from the oven and set aside to cool completely. When cool, spread the mushroom pâté over the surface, coating it evenly. Roll out the pastry until 0.5cm thick and large enough to encase the cauliflower. Grate half the cheddar over the pastry, then sit the cauliflower, florets-side down, in the centre. Bring the pastry up over the cauliflower and fold the edges over the base of the cauliflower, sealing as you go and making sure there are no gaps. Line a baking sheet with non-stick baking paper. Put the cauliflower on the tray, then brush all over with half the beaten egg. Chill for 30 minutes, then brush with the remaining egg. Bake for 25 minutes until the pastry is golden and almost cooked through, then top with the remaining cheese. Bake for a further 10-15 minutes until golden and oozing. Meanwhile, make the gravy. Put the oil and flour in a large saucepan and stir well, bring to a simmer over a medium heat, then cook, stirring, for 2-3 minutes. Whisk in the wine using a balloon whisk. Add the soaked mushrooms and their liquid, then simmer for 10-15 minutes. Taste and season, then add the remaining ingredients and a little water, if needed, to bring it to your preferred consistency. Serve wedges of the cauliflower wellington with the gravy and steamed veg, if you like. If you eat meat, wrap a layer of parma ham over the pâté at the end of step 4. 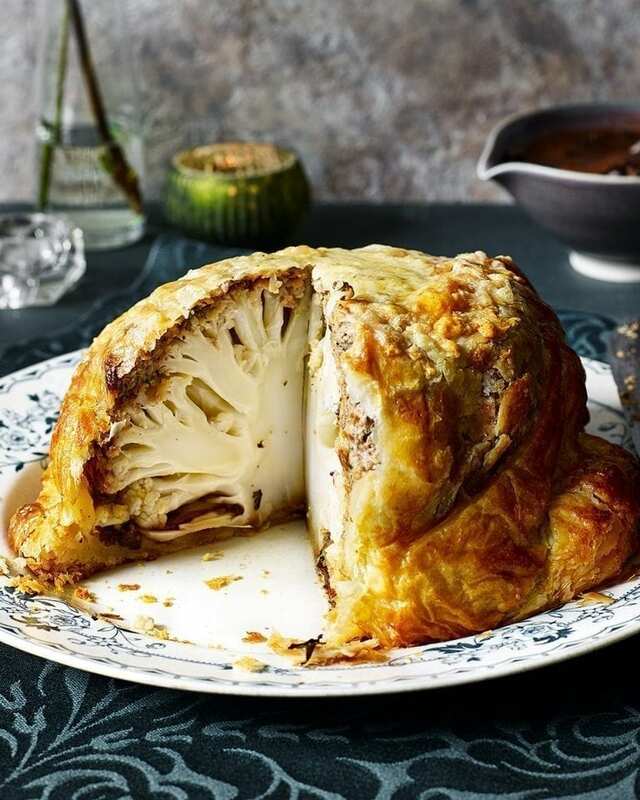 Roast the cauliflower up to 24 hours ahead, cool, then wrap in cling film and chill. Make the mushroom pâté up to 24 hours ahead, cover and chill. Our friends at Majestic Wine recommend Caixas Albarino. A quintessential Albariño balancing bursts of peach and zesty lemon. With mouthwatering minerality and fresh acidity, it’s a perfect match for this recipe’s indulgent, buttery pastry. Use promo code DELICIOUS to get £10 off when you spend £40 or more. This is a very tasty recipe. Two problems: Puff pastry is undercooked on the bottom, so I will use a baking stone next time. Cauliflower is too hard at the centre – even when I roasted it for 50 minutes – so I need to find a way to overcome this. Also – the gravy is delicious and I make more than the recipe states.